Okay, the Burger King dog is fecking priceless! All of these rock my socks off but the Krispy Kreme dog is totally FTW! The Krispy Kreme one is priceless. That is the creepiest thing I've ever seen. 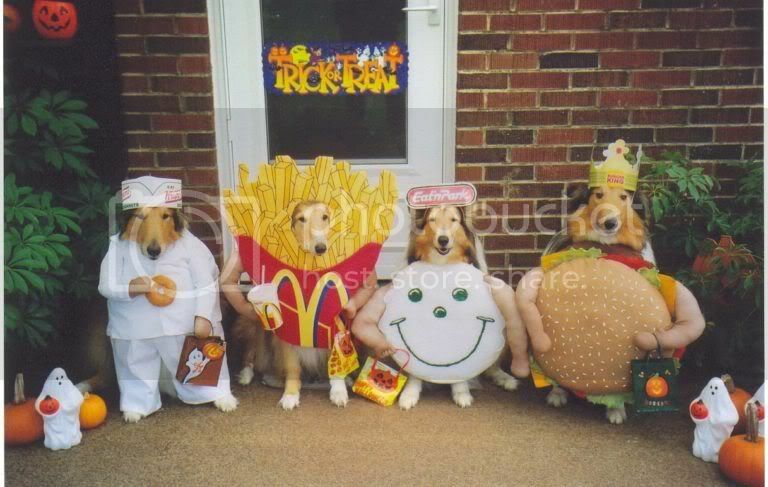 my dad emailed me that pic along with a bunch of other pictures of dogs dressed up. that one is by far my favorite. Shelties, FTW!! I had a sheltie growing up, and she was the best dog EVER. Probably because I never humiliated her like this. Ok, well there was the time I dressed her up in a bikini and stuffed the top of it with socks. I was 8 years old, leave me alone.